Every kid loves a good school field trip. Freedom from the usual routine was always highly anticipated, and we all looked forward to the handful of times each year we were able to learn outside the four walls of our classroom. 3rd grade: Mushroom Capital of the World. School biology unit on the fungi kingdom. Hoping it was an exotic location. Discovering it was a 40 minute bus ride to another quiet suburb of Philadelphia, Kennett Square. Dark, damp rooms of the mushroom museum. Worst museum gift shop ever. Inspiration for this recipe, almost 20 years later. 5th grade: The Pennsylvania Farm Show. Leaving home before the sun came up to take a train to Harrisburg. Eating cotton candy. Watching the awards ceremony for best-in-show in the poultry category. Participating in the Angel Food Cake contest. Being uninterested in the ‘Outdoor Power Equipment Showcase.’ Tasting Blue Ribbon apple pie. 6th grade: New York City. 200 11-year-olds on buses to the big city for the day. Buses breaking down on I-95 North. Sitting on the bus waiting. Finally reaching the Statue of Liberty and climbing to the very top. Seeing a broadway show – no memory of which one. Dining at a restaurant that regretted the decision to host 200 11-year-olds. Ordering sweet potato fries for the first time. Sleeping kids on the bus ride home. 8th grade? : Valley Forge. American history unit. Hot summer day right before the school year ended. Lots of grassy hills. American Revolutionary War or Civil War? Revolutionary. Oh right, Civil War was Gettysburg. Ice cream at the end of the day. Surprise quiz on what we had seen the next day in class. 10th grade: Disney World. Yes, that’s right. Marching band parade down Main Street. Seeing behind the scenes at Disney – not as rosy at ‘on set’ in the park. Sunburn, sunburn, sunburn. Riding Space Mountain over and over again. Fireworks over the lake in Epcot. Fun. 1. Heat olive oil in a skillet. Once hot, add minced garlic and cook for 1 minute or until you smell the garlic strongly. 2. Add the mushrooms and cook for 10-15 minutes. Mushrooms will lose their juice then begin to reabsorb it. 3. Toast pine nuts in a dry skillet over medium heat until browned and fragrant. Watch carefully, as they go from toasted to burnt very quickly. 4. Toward the end of cooking the mushrooms, add rosemary, salt, and pepper to taste. 5. 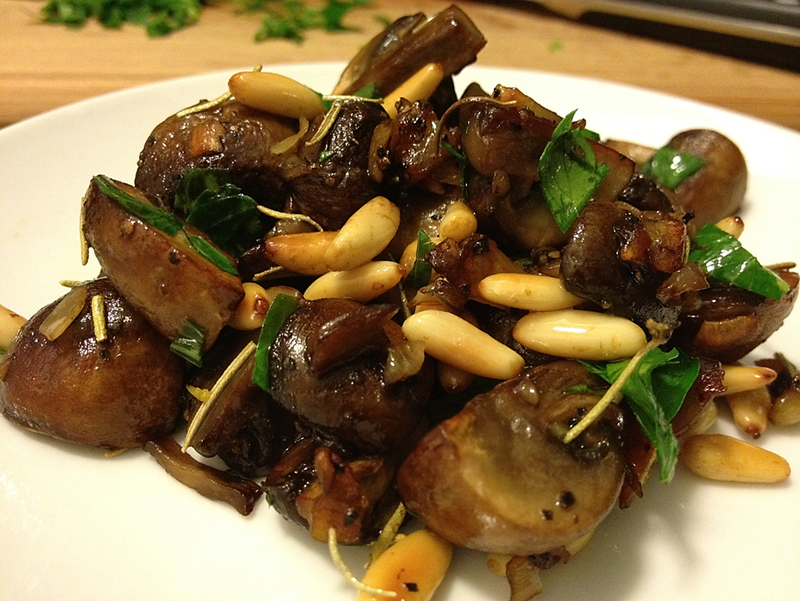 Mix mushrooms, pine nuts, and parsely.